Considerazioni per un efficace contenimento dell'infezione Conficker.B. FakeXPA... Journey of a Rogue. Mio nuovo editoriale Live sul sito Microsoft Security!. Win32/FakeSecSen - A Nasty Piece of Work. New Rogue Software: Security 2009. 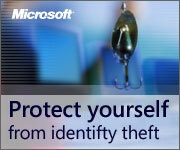 Microsoft Security E-mail Spoofs with Malware. New Rogue Antivirus: Antivirus 2010. Adobe Flash Player's "Clipboard Attack" Update. A new rogue was released: AntiVirus Lab 2009. Imageshack Adobe Shockwave Flash Attacks in-the-wild. Anatomy of a malware scam - The evil genius of XP Antivirus 2008. Alert: Adobe Flash Player's "Clipboard Attack". Malware rides the wave of 2008 Beijing Olympics. ALERT: Falso aggiornamento per Internet Explorer 7 in circolazione. Alert: Installer fraudolenti di Adobe Flash Player.